I can caveat my dislike by pointing out that I do appreciate cars in terms of product design, and Minis are a beautiful design full of personality, which is no doubt a huge part of its success. I imagine the LEGO version will be a massive success too as it is just as adorable if not more, and one of those rare sets that WOAFOLs might even concede to having displayed in publicly visible areas in the home. 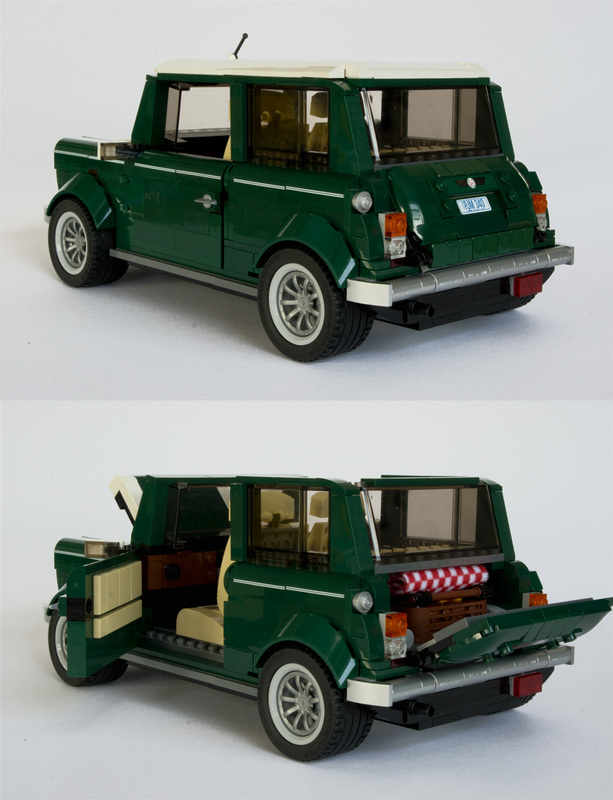 I have a great fondness for the previous 'Creator Expert' car released in 2011, 10220 Volkswagen T1 Camper Van, which I rate as one of my "top sets ever" thanks to the interesting build full of quirky details. So another release in the same vein definitely had me excited. The chosen colour is British racing green, the UK's representative colour in international motor racing (apparently. I wouldn't know. I learned something today.) This is a great choice and not just for patriotic reasons. Red is a colour perhaps more commonly associated with Minis, but that would have looked boring alongside the VW Camper. No, the best thing about the choice of British racing green is that you get a massive array of Dark Green [BL]/Earth Green [TLG] elements; many of which are new to this colour. Let's take a look at those first. 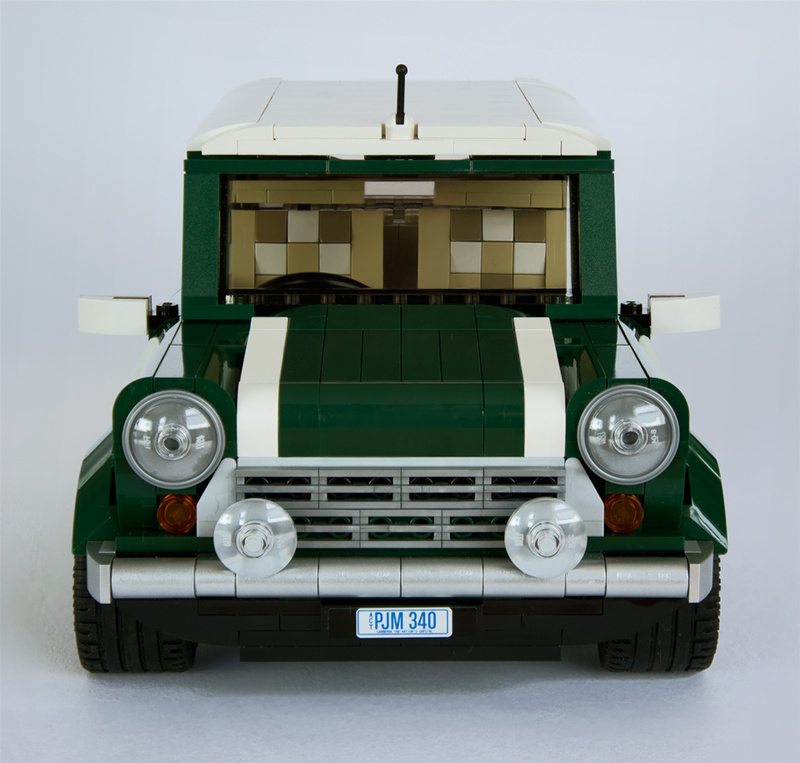 Most prominent on the finished vehicle are the twelve 1X4X1 1/3 bricks with curved tops, printed with two thin lines (Element ID 6055890 | Design ID 6191/10314). This is the first time that this part has been printed upon. They're very smart and may well find other uses... consequently, I couldn't bring myself to add the cute little round stickers to two of them. There are also regular unprinted ones (Element ID 6062010 6191/10314) which have never been seen in Earth Green before, but just two of those. Nor could I bring myself to defile the four 1X2X3 73° slopes (Element ID 6055224 | Design ID 4460) with stickers as these, too, are new and exclusive. The sticker is Black with an Earth Green stripe, to suggest the slope is a diagonal door post. I think you'll either love or hate this solution; I don't care as I'm quite happy about how it looks without these stickers at all. I applied the other stickers though. There are two sheets, one silver-backed. 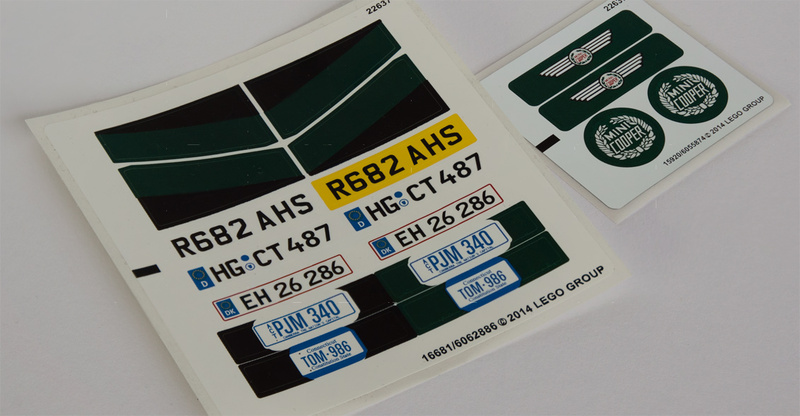 You get the choice of UK, German, Danish, Australian or American number plates! I plumped for my former home over my current one and applied the Aussie ones, which are from the state called Australian Capital Territory... basically, Canberra. With these stickers going on Black and Earth Green 1X4 tiles, you should be happy to create several versions if you wish. Another very prominent new element is the 3X6X1 curved windscreen (Element ID 6056443 | Design ID 62360) used for mudguards, which just looks perfect! 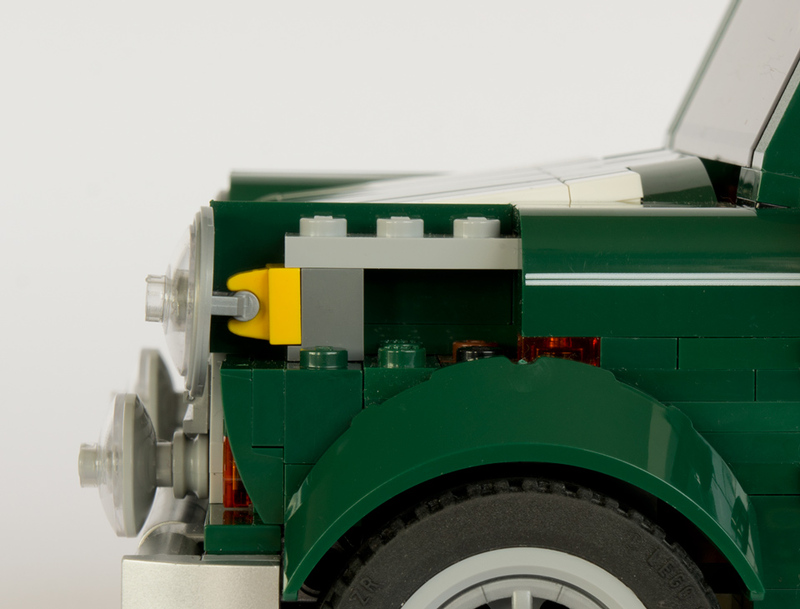 This is the first time this part has appeared in an opaque colour which isn't a neutral tone; the downside of which is that if you want to reproduce a Mini in a different colour to Earth Green, you're limited to Black or White with this part. Another limitation you'll face are the two 3X4X2/3 triple curved wedges (Element ID 6055227 | Design ID 93604), typically used for car rooves or bonnets but here used nicely on the boot. This uncommon part has only appeared in a handful of sets in Light Aqua[BL]/Aqua [TLG] or White. 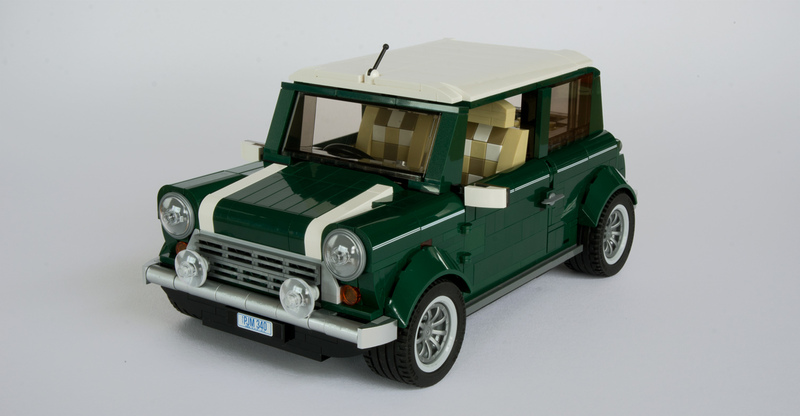 So unless you substitute parts, perhaps White is the only option for recolouring your Mini (not that I've checked all parts but it feels likely). 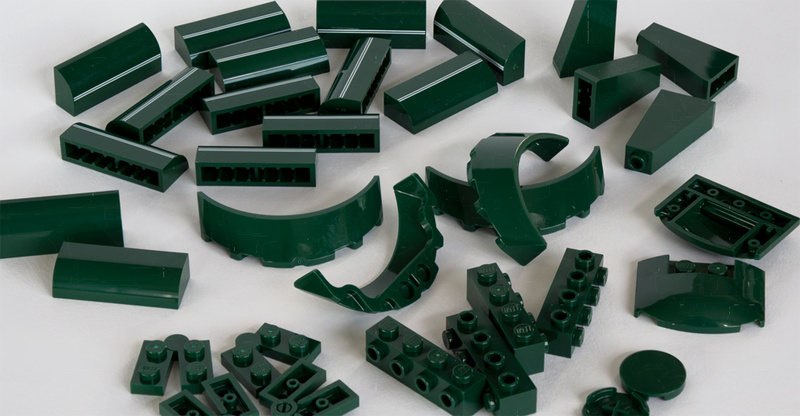 Some of the other parts pictured above appearing in Earth Green for the first time are common, useful ones. There are four classic 1X2/1X2 hinge plates (Element ID 6056380 | Design ID 73983) but these are not exclusive, as they also appear in Marvel 76020 Knowhere Escape Mission . There are two 2X2 round tiles (Element ID 6064113 | Design ID 4150) which have the outgoing "X" style underneath, or mine do anyway. This surprised me given that Earth Green is a new colour for these, but I guess it may simply be that some factories still have the old mould in good condition. 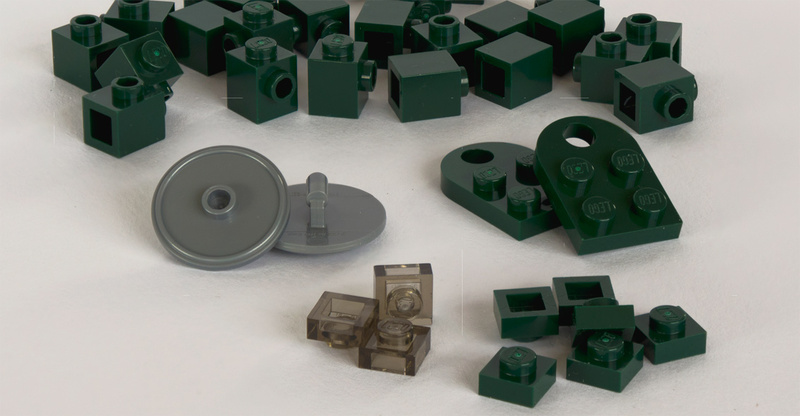 I included the six 1X4 SNOT bricks in Earth Green (Element ID 6055329 | Design ID 30414) in my pic of exclusive Dark Green elements above, but later realised these have actually appeared in one other set - back in 2005. Whilst on the subject, let's look at the other elements you get that have only appeared in one other set. The Earth Green 1X1 SNOT brick (Element ID 6055222 | Design ID 87087) has only recently appeared in Friends 41039 Sunshine Ranch but there you only got one; here there are 24! The Flat Silver [BL]/Silver Metallic round shield (Element ID 6076677 | Design ID 17835/91884) was in 10243 Parisian Restaurant and you get two here, for the headlights which I'll highlight later. 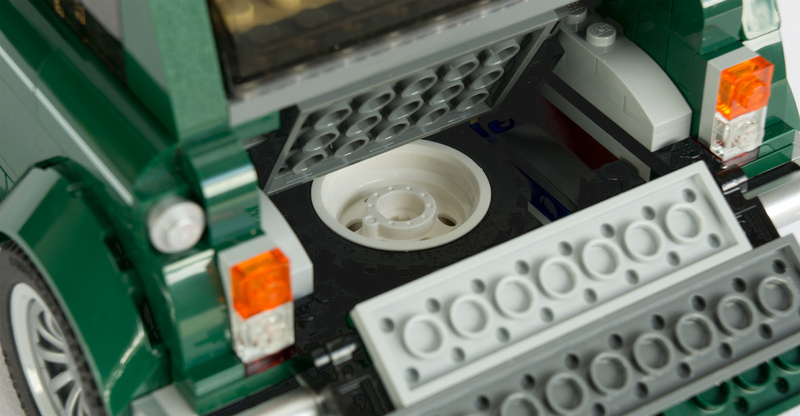 Two coupling plates (known as Plate, Modified 3 x 2 with Hole on BrickLink) are present in Earth Green (Element ID 6064112 | Design ID 3176) having only appeared in one 2005 set before. There are a miserly two 1X1 plates in Trans-Black [BL]/Tr. Brown [TLG] (Element ID 6030982 | Design ID 30008) which were also in Architecture 21017 Imperial Hotel . And the same part is present in Earth Green (Element ID 6055169 | Design ID 3024) having recently appeared for the first time in Star Wars 75059 Sandcrawler" . There are a couple more, not pictured above. The 1X2X2/3 'baby' bow in Earth Green (Element ID 6055225 | Design ID 11477) was mentioned as a new element by Tim Goddard just recently in his review of new Chima set 70135 Cragger's Fire Striker. There are eight here. 2X14 plates, which sound common, are still a relatively new part and the two Reddish Brown ones here (Element ID 6004996 | Design ID 91988) have only previously appeared in Star Wars 75020 Jabba's Sail Barge . The set also contains what I imagine is a completely new part, but seeing as its made of cloth, it doesn't excite New Elementary. 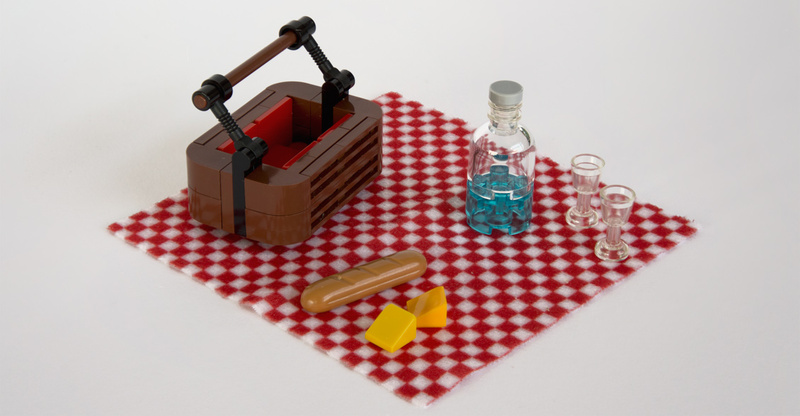 But it is awfully cute - a gingham rug (Element ID 6057892) to have a picnic upon. The hamper is a great little build, the bottle just perfect. The glasses at first feel too small, but in fact fit the scale here better than they usually do, when used with minifigs! 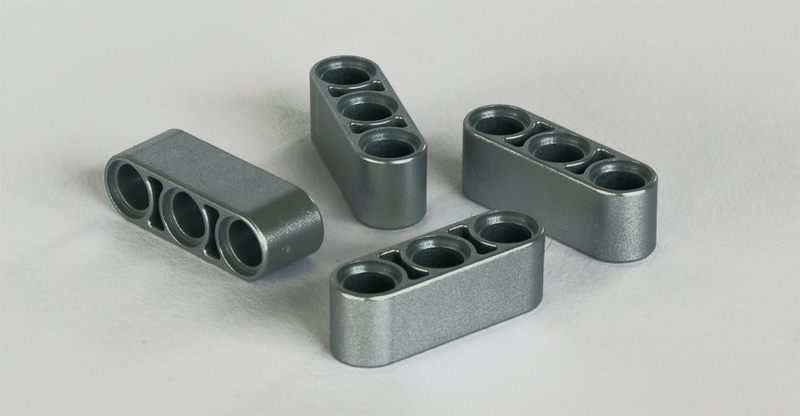 Technically speaking (ba-doom) there's a new colour for the 1X3 beam in Silver Metallic (Element ID 6066048 | Design ID 32523); previously this has appeared in Pearl Light Gray [BL]/Silver [TLG]. There are four, and along with pin connectors and baby bows in Silver Metallic they create the gorgeous bumpers on the Mini. As you'd hope, the build is long, detailed and satisfying. Aren't the seats beautiful? They realistically tilt forward to allow passengers into the back! Being five studs wide they are an unusual build, and somewhat dizzying too as you apply the different shades of tiles and cheese slopes. To make space for the central handbrake, the seats are attached using the offset technique with jumpers. The gearstick is attached using a technique I don't remember seeing before, certainly not in an official set? 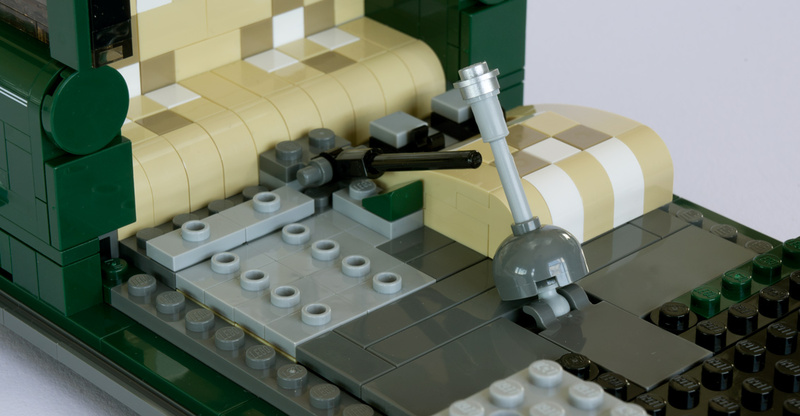 At the base of the gearstick, a ball connector (Design ID 2736) is wedged in between the clips of the 2X3 tile with two clips (Design ID 30350), which allows the gearstick a wide range of movement whilst pointing upwards - something that could not have been achieved here using the new ball and cup connectors. What surprises me most about this connection is that it is actually legal! I also tried it using a 1X2 plate with two clips; that also works. 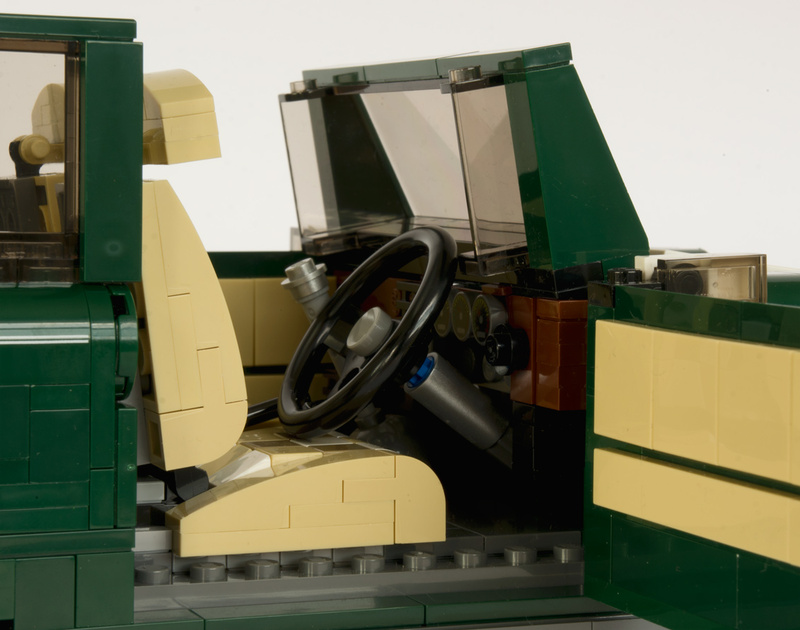 The front windscreen is slightly tilted back using hinge bricks; I presume to match the angle of the original. Nice touch. The dashboard is loaded with details including three of those excellent new 1X1 round tiles with a dial pattern (6030333). The Technic steering wheel (Design ID 2741) is a lovely shape but is too large for the model; it touches both the windscreen and the seat so there's no room for legs... should you have wished to construct a figure that fits the model's scale. Underneath all this is a hinged panel that reveals another cavity, housing a spare tyre! 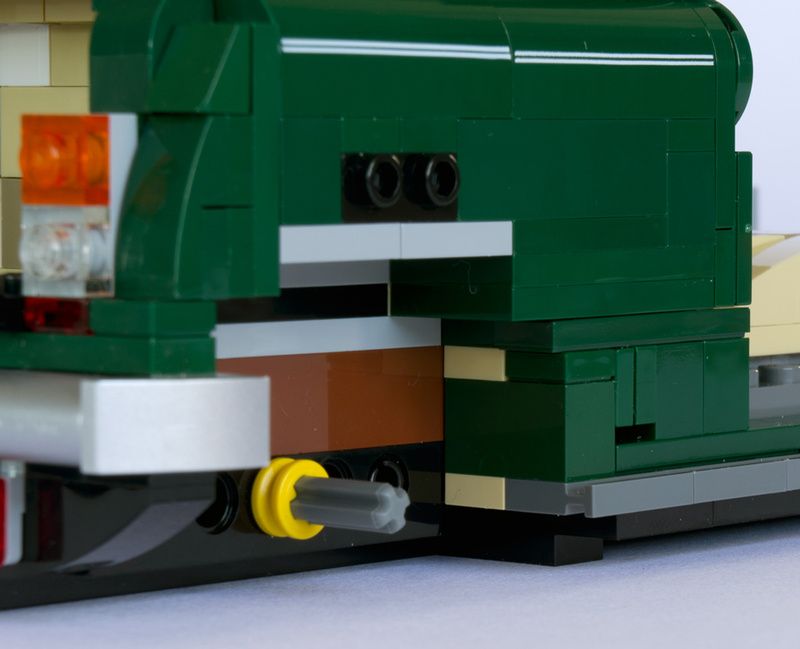 Amusingly, it's a differently sized tyre to those actually on the vehicle, but given that you won't be stuck in the countryside with your LEGO Mini as sole mode of transport, it's really not a problem. 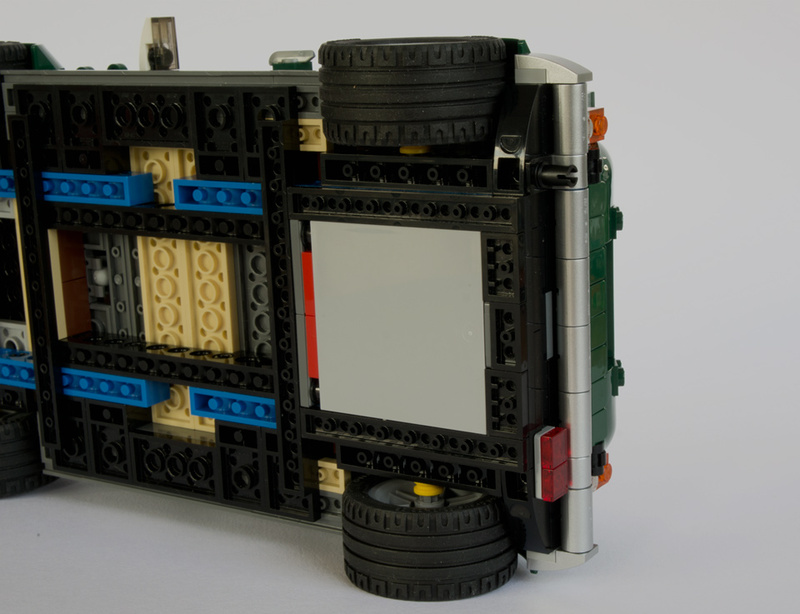 To fit the tyre into this incredibly tight space, a 1X6X5 panel (one of the rare LEGO parts that is a perfect geometric square) is built horizontally into the chassis - an unusual and ingenious solution. Another section using precise geometry is the way the roof fits around that tilted front windscreen. Three Black 2X2 hinge tops are used; their narrower height accommodates the difference caused by the lowering of the windscreen. The use of this part has another benefit; hinge tops have recessed studs, which permits the row of White plates at the front of the roof to be offset, creating finer detail on the curvature of the roof and allows the antenna to be centred. It's also worth noting that the roof is far more robust than the one on the VW Camper, which had a tendency to begin splitting up as you used it. Here are some other highlights of the build. The sides of the car around the doors and rear wheels require some complex SNOT work. The headlights are attached using some ingenious geometry. 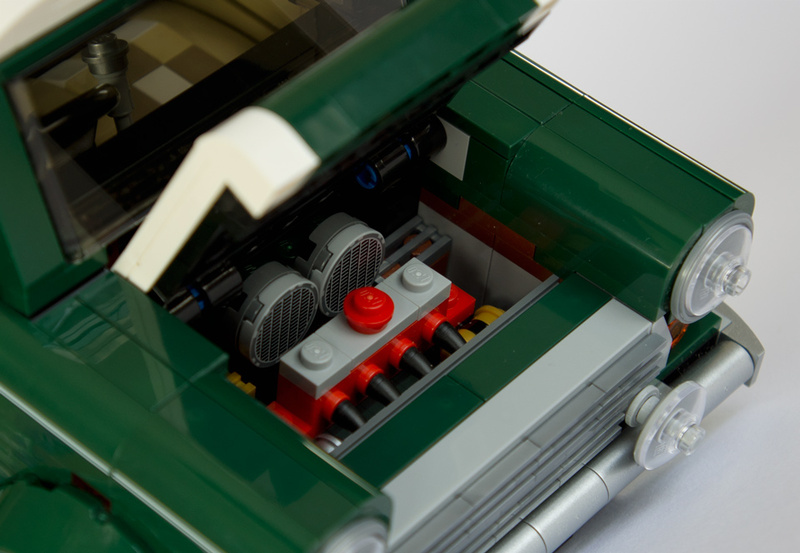 The motor is highly detailed, and presumably realistic! Well, this set falls under the AFOL-friendly Creator Expert line and I'm yet to be disappointed by one of those. No exception here: the build is intricate and enlightening, even including a useful technique I've never seen before. It makes a wonderful display model but is worth breaking up into your parts collection as it has an excellent inventory, unless you don't use Earth Green. It has loads of new parts and ones only appearing in one other set... so many in fact that there are many more great parts in this set I haven't had room to mention. It's inevitable, but perhaps slightly unfair, to compare it to the VW Camper which was larger by 250 pieces and had a lot more interior space to have fun in. At first I felt it didn't live up to my happy memories of building that set, but on reflection I can see this has more to do with the enormous amount of humour injected into the interior of the VW Camper. The Mini is stuffed with great details too, like the engine, seats and contents of the boot, and I'd describe these more as exquisite rather than humourous. Oh, and it has ice-skates for door handles! The alternate number plates are a lovely touch, and if you want to go that one step further, you can order your own personalised printed number plate tiles from Minifigs.me! Given my inexperience in all things automotive I won't comment on the model's similarity to the real thing. I've seen a complaint online about it being "too boxy", which I always find an amusing comment when applied to something made of LEGO! If we imagine a Venn diagram of AFOLs and Mini fans (AFOMs? ), I suspect it is only the intersection of the two that will find cause for great complaint. AFOMs will probably just be blown away by how far LEGO has come along since they last paid attention, and frankly they are probably the majority of the market for this set. My thanks to LEGO's Community and Events Engagement Team for supplying this set. That ball in the clips technique was previously used on the windsurfer's catamaran in the Coast Guard helicopter set 60013. Interesting, thanks Brian. Good to see that using the plate version is also legal. 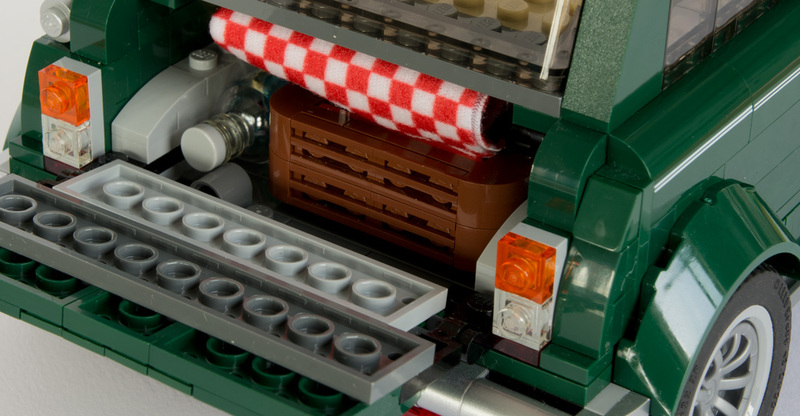 The biggest advantage of a car, for an AFOL, is being able to haul large volumes of LEGO product home, or large volumes of LEGO MOCs (and support materials like custom tables) to a show. I'm running around a dozen shows per year, personally, in a club that runs 20+ shows per year with the main chapter, and probably at least 15 per year now with our west-side chapter, and one of our members is working on a third building that will be capable of filling his Jeep Cherokee to capacity all by itself. Oh, and there's _NO_ mass transit system worth speaking of in the entire state of Michigan. On the model design, the reason the tire/wheel in the trunk is different from the ones it rides on is that car companies started going cheap by switching from full-size spares (usually a stamped sheet-metal wheel, but with the same size tire as the other four), to undersized ones, which are often referred to as donuts or 50/50's (as in, don't drive faster than 50mph or more than 50 miles distance). Same basic design as the full-size wheels, but the tires tend to have rounded tread cross-sections (like LEGO balloon tires) instead of crisp corners. The only thing that's off about that is that the wheel should be black instead of white. Nice review Tim, I'm now thinking if there is anything I could build in dark green to make buying the set worth while (micro-mini-space?). I learnt to drive in a mini so I've got a soft spot for it anyway. Ooooh! Nice. So all parts were available in white? It actually looks weird in all-white. Maybe if the roof, mirrors, and hood stripes were in a different color it'd look normal? Healthy couple. Going out for a picnic with a water bottle.